NATE Chairman Jimmy Miller at the left of President Donald Trump listens to the President as he discusses the need for American to roll out 5G as quickly as possible. FCC Chairman Ajit Pai, at left, also spoke at the White House today. A delegation of NATE leaders, consisting of personnel ranging from tower technicians, foremen and company owners, participated in a 5G technology themed event at the White House in Washington, D.C. this afternoon. The NATE members were invited to participate by President Donald Trump, FCC Chairman Ajit Pai and key officials at the White House. Ivanka Trump welcomes Jordyn Ladner and other NATE members, and rural cattle farmers desirous of broadband coverage shortly before President Trump addressed the nation. At the event, President Trump delivered remarks on the importance of the United States winning the global race to 5G. During his speech, the President also stressed the Administration’s support and commitment to next generation technologies and expanding rural broadband connectivity to all corners of the country in order to continue keeping the American economy strong and vibrant. FCC Chairman Ajit Pai (See full remarks below) utilized the occasion of the event to provide on update on the agency’s 5G FAST plan and make two major FCC announcements that will positively impact both 5G technology and rural broadband deployments. First, Chairman Pai announced that the FCC plans to start the process to move towards conducting the largest spectrum incentive auction in American history this summer. The auction will include new millimeter (MM wave) frequency spectrum bands that are vital for the industry to access for future 5G deployment. Second, Chairman Pai announced that the FCC is moving forward to develop a $20 billion Rural Digital Opportunity Fund with the goal of closing the digital divide by bringing broadband connectivity to rural areas of the country. 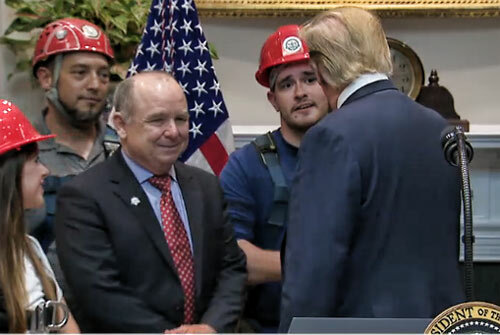 President Trump shakes hands with tower technician John Dougherty, thanking him for his service to ensure that 5G can be built out through the dedication and talent of telecom professionals. 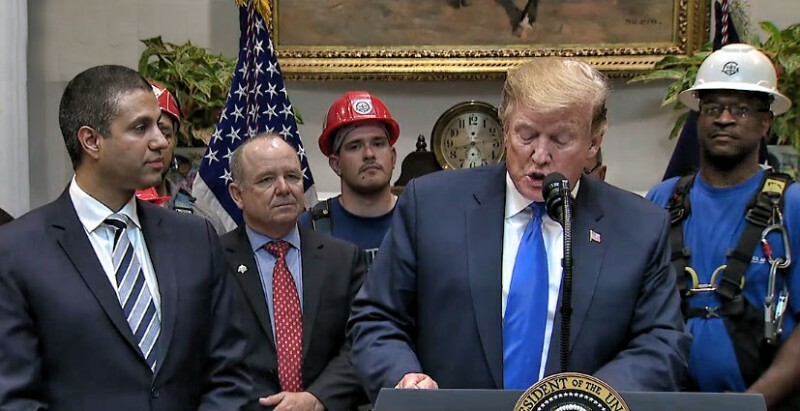 At the event, a delegation of NATE representatives were strategically positioned by President Trump during his remarks wearing their harnesses, hardhats and other safety gear. This platform provided outstanding recognition to the role that tower technicians play to enable a connected, prosperous economy. NATE Chairman Jimmy Miller of MillerCo, Inc., Gulfport, Mississippi’; Carlos Church, MillerCo, Inc.; Jordyn Ladner, MillerCo, Inc.; John Dougherty, Millennia Contracting, Inc.; New Castle, Delaware; Kenneth Massengale, Teltronic Towers, Capitol Heights, Maryland; Jeff Tinio, Teltronic Towers; and Jack Ray, Above All Tower Climbing, LLC, Bonne Terre, Missouri. “I would like to thank President Trump and the White House staff for the opportunity to participate in today’s event,” said Church, “It was an honor to stand by the President during his address and listen to his speech on 5G. This is an experience I will never forget,” added Church. 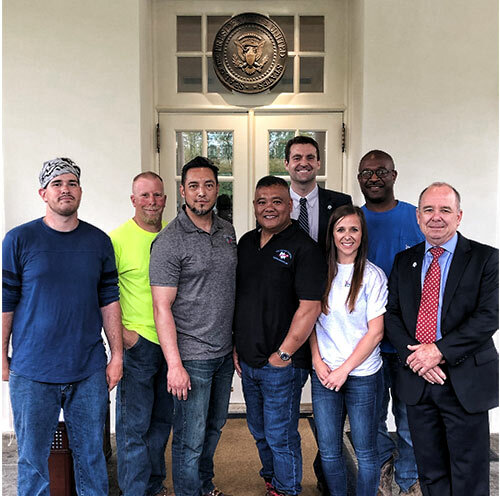 NATE members at the White House included, from left to right, John Dougherty, Jack Ray, Kenneth Massengale, Jeff Tinio, Todd Schlekeway, Jordyn Ladner, Carlos Church and Jimmy Miller. President Trump delivered remarks on 5G Technology and FCC Chairman Pai discussed future spectrum auctions and rural broadband. “It was very encouraging to witness President Trump and Chairman Pai utilize the platform of today’s festivities to pay homage to the workforce by sharing the stage with them,” said Schlekeway “A safe and skilled tower technician workforce are the most precious assets available to the industry and expanding this pipeline of workers will be key to maintain America’s premier position in wireless. It is great to know that NATE and President Trump share common synergies and mutual goals related to workforce development and the Association is committed to working alongside the Administration to develop additional training pathways and programs necessary to expand the industry’s labor force pool,” Schlekeway added. Thank you, Mr. President, for your compelling vision of U.S. leadership in 5G. I also want thank Larry Kudlow, Director of the National Economic Council, for your steadfast support of this vision. Mr. President, as you observed, America must win the race to 5G, the next generation of wireless connectivity. This matters for two key reasons. The first is national competitiveness. We want the good-paying jobs that develop and deploy 5G technologies to be created here. We want these technologies to give our economy a leg up as we compete against the rest of the world. The second reason U.S. leadership matters is that 5G will improve Americans’ lives in so many ways. From precision agriculture to smart transportation networks to telemedicine and more, we want Americans to be the first to benefit from this new digital revolution, while protecting our innovators and citizens. And we don’t want rural Americans to be left behind. That same month, Cisco projected that in three years, 5G would be more than twice as prevalent in North America as in Asia. 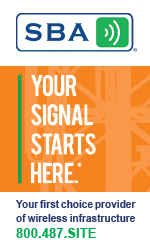 Last week, CTIA reported that “America leads the world with the most commercial 5G deployments of any nation.” And on Tuesday, it was reported that 5G-related job listings increased 12% in just the past three weeks, according to data from an online job search service. Today, 5G is a success story—an American success story. How are we getting the job done? As the lead agency on 5G, the FCC is pursuing a three-part strategy called the 5G FAST Plan. First, we’re freeing up spectrum, the invisible airwaves that carry wireless traffic. We finished our first 5G spectrum auction in January, and we’re holding a second right now that’s already generated almost $2 billion in bids. Second, we’re making it easier to install wireless infrastructure. 5G will rely heavily on a web of small antennas. But when I came into office, regulations designed for tall towers threatened to strangle our 5G future in red tape. We’ve eliminated these rules, because infrastructure the size of a pizza box shouldn’t have to jump through the same regulatory hoops as a 200-foot tower. Third, we’ve taken action to encourage the deployment of optical fiber. That’s because 5G isn’t just about wireless. We’ll also need strong fiber networks to carry traffic once it goes from the air to the ground. We’ve done a lot to make that happen, including ending heavy-handed regulations imposed by the prior Administration. Here too, we’re getting results. Last year, fiber was deployed to more new locations than in any year before. But in the race to 5G, our early success is still—early. We still need to do more. And we will. Today, I’m announcing two new steps the FCC will take to build on our momentum. First, the FCC intends to start its third 5G spectrum auction on December 10 of this year. This will be the largest spectrum auction in our nation’s history. We’ll be selling 3,400 megahertz in three different bands. For those who aren’t wireless experts, that’s a lot of spectrum. Second, to help build the infrastructure of the future, the FCC aims to create a new $20.4 billion Rural Digital Opportunity Fund at the FCC. This money will extend high-speed broadband to up to four million homes and small businesses in rural America. These next-generation networks will bring greater economic opportunity to America’s Heartland and will help support future 5G technologies. In closing, thank you again, Mr. President, for your leadership on 5G. Your White House has advanced your vision in many ways, from international treaty negotiations to much-needed regulatory reforms. I appreciate all of these efforts. And in the same spirit, this FCC will help build a great and lasting legacy of American success on 5G.